I side-stepped my plans to write this weekend in order to complete a bit more historical research at The Foley and Searls historical libraries in Nevada City, California. I’m inserting 3 to 4 chapters in advance of my original start to Part 2 (I’m no “pantster” so I will be completing a detailed outline prior to a writing session). I’m overwhelmed at the many facets of daily living back in 1904. Business advertisements, talk of war in Russia, buzz about inventions such as bread machines and electric lighting, town gossip, and a slew of reports on tragic deaths, disease and murder from across the country fill page after page of newspaper articles stored on microfiche film. Aside from the inventions, I could have been reading today’s newspaper! After gleaning what I could from the libraries in Nevada City, I made my way to the sister town of Grass Valley, just three miles away. As I soaked up the sun in the Safeway parking lot on Neal Street, my true-life flashbacks (and history in this same town) made me smile. I was so ignorant and lost back then–much like my character, Lydia. Although as naive as she is, I envy her willingness to trust God more than I knew how at her age. Yet, He still had a plan for me despite my depravity and selfishness. As a teenager growing up there, Grass Valley and Nevada City were just little “dead-end” towns with nothing to offer. Back in 1992, I was a loner, 17 year-old girl with over-sized glasses, a wardrobe that consisted of second-hand men’s flannels and stretch pants, and spent my weekend days searching for spare coins in hopes to hit up some stranger to buy me a $1.29 pack of generic cigarettes. Wow-how a life can transform over time! I marveled as an observer over 20 years later. This town is full of the same eclectic characters and trendy tourists as it was back then. Mill Street was a bustle of causally dressed tourist or middle-class families eating ice cream and admiring window displays. Dispersed between them, groups of two or three teenagers (eerily dressed similarly to my own attire when I was their age) wandered with that same look of a pointless life I must have had. Another, obviously bored teen or twenty-something, kept rounding the block in his souped-up Volkswagen bug, the revving of his engine causing my heart to skip every time he drove past. Oh, and I can’t forget the ancient man with dreadlocks and faded, ill-fitting layers and a backpack who sneaked onto the brick-paved crosswalk directly in front of my car. Luckily, I realized I had a blind-spot to possible pedestrians due to over-crowded street parking, and my foot was already on the brake. 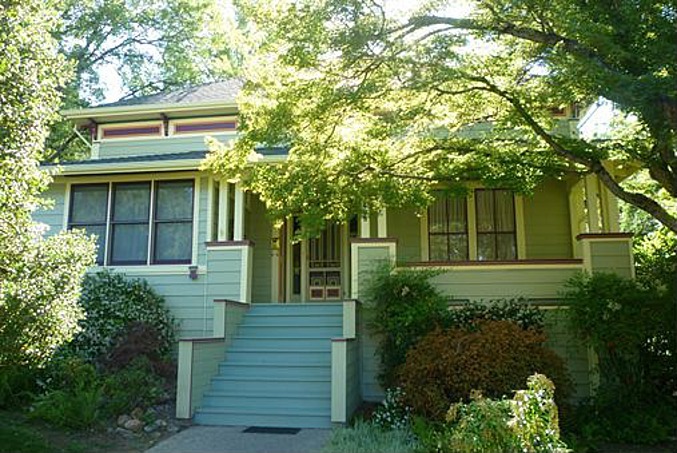 The weather was absolutely beautiful in the foothills and, after driving around the main streets, I took a detour to admire a historical home for sale in Downtown Grass Valley. Maybe one day my writing career will enable me and my family to live in one of those homes, rich in history and smack dab in the middle of a great setting for future novels. Thinking back to how unaware I was of the business, politics, and news of the day, I realized Lydia won’t know these details either. And most of what she observes, she won’t have words to explain unless someone else does it for her. A challenge for sure, but as long as I stay focused on the facts that matter to the plot, I will trust the story will lead me to share only what is needed. Through the weekend, my sister and daughter willingly helped me talk through some walls in my plot. As a result, I have an improved plan for integrating the historical setting and creating conflict between key characters as the plot moves toward the climactic 1906 earthquake. The devastation will create desperate circumstances that force primary and secondary characters to make some difficult choices. My challenge is to make these pivotal moments realistic while transforming each character–and all from the POV of Lydia whose life experience at this point is 17 years in an isolated life on a farm with her mother plus 2 years of adjusting to life among people in a quickly dissipating post-Gold Rush mining town. I’m excited to get going and wrap this thing up. I’m even more excited at the response I get from everyone I tell about this novel. They can’t wait to read it and nearly everyone thinks it would make a great movie. But, I’m not letting it get to my head. It’s easy to explain the plot premise. It’s an entirely different thing to actually write it. I just hope my style and quality of writing will meet everyone’s expectations. Although I have a timeline to stick to, I will not disappoint my readers by rushing any part of this process. Whether it’s backstory or the need to turn a narrative paragraph into a full chapter of character-revealing dialogue, I pray every word will captivate you, catapult you back in time, and keep you turning the pages until the very end.